“Buckle your seat belts. You’re in for a wild ride,” Washington Ballet artistic director, Septime Webre, warned the audience, before the curtain went up on his brand-new production, Alice (in Wonderland), presented by the company at the Kennedy Center’s Eisenhower Theater this April. As it turned out, he was only half-joking. 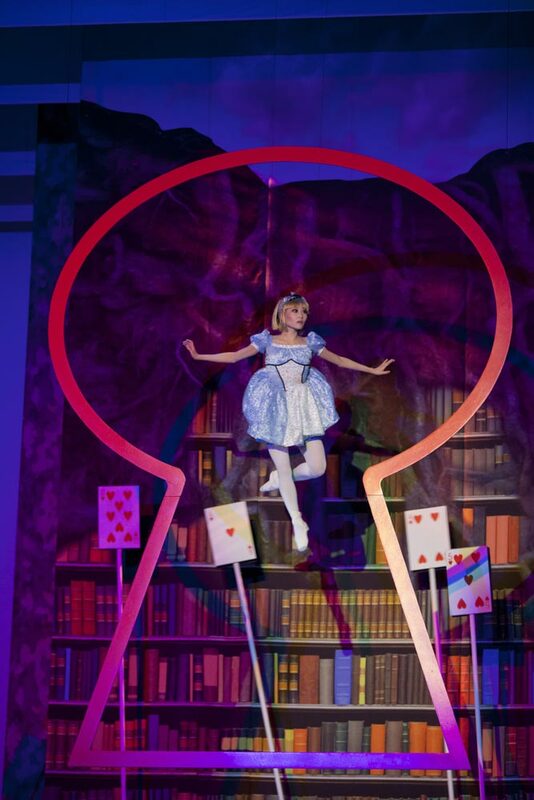 Based on Lewis Carroll’s “Alice’s Adventures in Wonderland” and the sequel “Through the Looking-Glass,” Webre’s Alice brimmed with energy, excitement, and innovation. 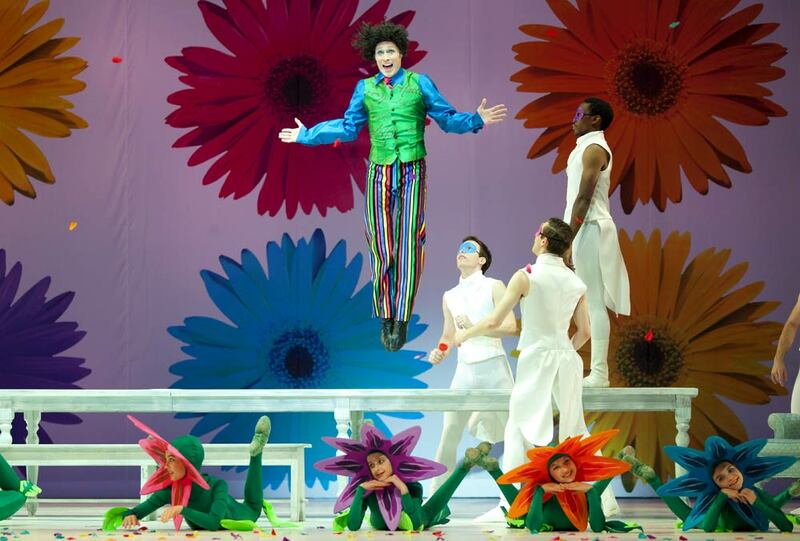 His spectacular take on Alice’s whimsical adventures – a roller coaster trip down a rabbit hole into the enchanted and upside-down world of the little girl’s imagination – goes far beyond the ordinary ballet adaptation of a story book. Webre did a marvelous job creating steps in all manner of dance styles for this Alice, capturing in motion the topsy-turvy magic of Wonderland and the bizarre characters that confront Alice on her incredible journey. With mastery and humor, the choreographer re-imagined the familiar tale as a mélange of dance, circus, theater, and puppetry that was visually stunning and enormously entertaining. The story unfurled with a kaleidoscopic speed yet managed to impress at all important turns. To give his libretto a narrative arc, Webre introduced a prologue, in which the audience met Alice and her chaotic family. All the family members would eventually populate Alice’s dreams, reappearing as various eccentric creatures of Wonderland: her neurotic mother as the domineering Queen of Hearts; her hapless father as the inept King of Hearts; her nutty twin sisters as Tweedle Dee and Tweedle Dum; and the grandparents as Dormouse and March Hare. Family friend Lewis Carroll meanwhile would morph into the Mad Hatter; and the ever-rushing butler into the White Rabbit. In the action-packed first act, Alice got her first dose of high-octane adventure as she followed the stylishly-dressed White Rabbit down the rabbit hole. Webre and his team created one stunning visual effect after another to ensure that her journey was as exhilarating as it was fun. At one point, Alice was suspended on wires 30 feet above the stage, evoking a giant doll, with Tweedle Dee and Tweedle Dum sailing by on a tandem bicycle. In another scene, she bravely took a plunge into the pool of tears (an amazing moment, with a fairly realistic water effect conveyed by a few lengths of a silky blue fabric). Alice zoomed from one scene to another in a thrilling rush of color and movement, meeting the assorted inhabitants of Wonderland: the Caterpillar, the Cheshire Cat, the Duchess, the Cook, and the Mad Hatter. A grand pas de deux of Dodo Bird and Eaglet, with a flock of leggy Flamingos gracefully framing the stage, was the most memorable dancing moment of Act I. An excellent display of pyrotechnics for the leading couple (Brooklyn Mack and Emily Ellis), this scene made for a hilarious spoof on Swan Lake. Bursting with inventive movement and glee, the ensemble of colorful dancing doors, spinning and jumping about the stage was thoroughly enjoyable. And the rowdily comic duet between the Duchess and the Cook gave more reason for mirth. The much shorter second act moved at a slower pace, with all its absurdities taking place at the Queen of Hearts’ magnificent Palace and Gardens, where Alice first played a game of croquet using flamingo mallets and hedgehogs as croquet balls and then fought the Queen’s dragon Jabberwock – an enormous puppet with a 24-foot wingspan designed by Eric Van Wyk. In Act II, classical dancing really took flight as a corps de ballet of playing cards flooded the stage in a theatrical ballet-extravaganza. 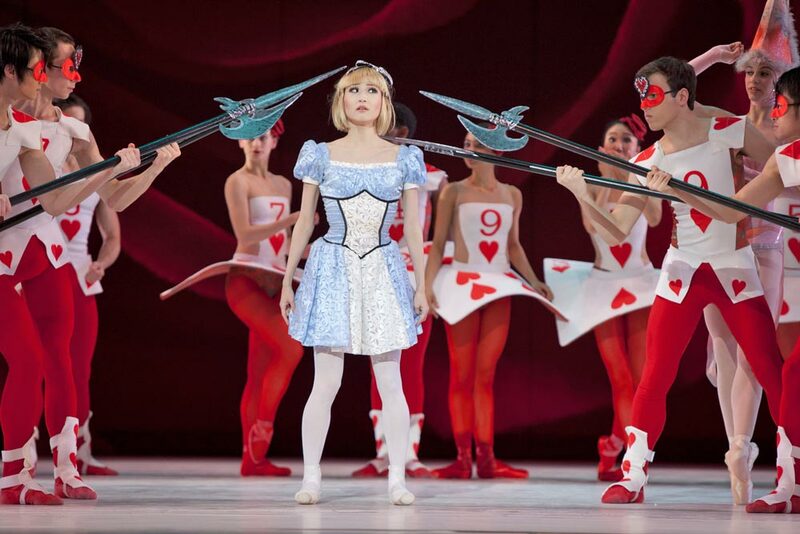 A perfect mixture of fantasy and adventure, this Alice was particularly geared toward children, and young dancers took no small part in the production. The whole show was populated by adorable little flamingos, quirky junior cards, colorful daisies, cute piglets, and fluffy hedgehogs, performed by students of the Washington Ballet, all of them having the time of their lives. On Saturday night, sporting a blond wig and little blue dress, Maki Onuki was a picture-perfect Alice, looking the part and beautifully projecting her heroine’s charm and endless curiosity. The petite Onuki proved an intrepid dancer and a real fireball of energy. In Webre’s vision, Alice is more an action hero than a passive observer. She engages her surroundings and is pivotal to the action and the story’s outcome. Physically and technically challenging, the role of Alice is not for the squeamish, but for Onuki, nothing seemed even slightly difficult in Webre’s highly athletic and hyperactive choreography. She hardly left the stage during the entire two hours of the ballet, dancing with a rock-solid technique and exuberance. Effortlessly conquering every hurdle of her amazing journey, Onuki’s Alice was the ballet’s focus and its shining star. Further standout performances came from the irresistible Sona Kharatian in a triple role as Alice’s mother, the Queen of Hearts, and the Caterpillar; Jared Nelson as Lewis Carroll and the Mad Hatter; and Luis R. Torres as the Cheshire Cat. Webre’s team of collaborators – composer Matthew Pierce, costume designer Liz Vandal, and set designer James Kronzer – all deserve a large share of credit for the ballet’s enormous appeal. Vandal’s costumes were the most transfixing part of the production. The designer has collaborated with the Washington Ballet on many occasions, outfitting, most notably Webre’s Carmina Burana, Carmen, Rite of Spring, and Juanita y Alicia. 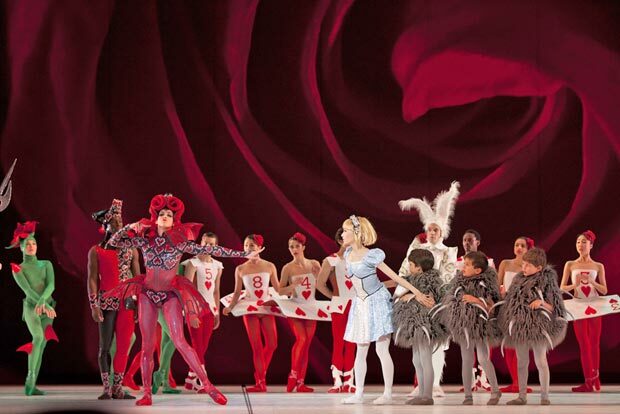 Yet her highly imaginative couture for Alice was a tour de force of ballet fashion and a work of art in its own right. A fantastic array of eye-catching colors and fabrics, combined with multitudes of arresting styles and silhouettes, added an extra dimension to the story and gave a vivid, fanciful look to its flamboyant personages. This turned out to be the most stylish and chic production by the Washington Ballet I have ever seen. The music commissioned from New York-based Pierce brought a sense of magic to the ballet. Influences of blues, jazz, rock, and pop came together in this bright and energetic score, enlivened the storytelling and gave the production a fresh, modern edge. The music was performed live, with Pierce himself in the pit, playing a solo violin and conducting a chamber orchestra of 10 string players and a percussionist. James Kronzer’s spectacular sets propelled the story and provided visual pleasure for the eyes, striking a balance between stark minimalism and plush elegance. Banners and décor seamlessly descended and rose to signify scene changes without interruption of the action. I was impressed by the way the stage decorations reflected the mood of each scene. The cool elegance of the alabaster-white décor for Alice’s family room in the Prologue brought a sense of mystery to the ballet’s opening. The bare moonlit stage invited a tranquil atmosphere and gave enough room for the Cheshire Cat to spin Alice around the stage in a creamy pas de deux in Act I. And the red opulence of the Queen’s Palace in Act II added a touch of drama to all the commotion onstage when Alice is arrested and put on trial for her ’crimes’. I particularly admired two mural-size backdrops: a close-up of the dark red rose in the scene at the Duchess’ cottage and a painting of solid-colored daisies on a white background (evoking Damien Hirst’s spot paintings) in the Mad Hatter’s Tea Party scene. It’s amazing how simplicity can be so visually effective! With Alice, Septime Webre has a smash hit on his hands. The new ballet has broken all records for the ticket sales (all performances were sold out far in advance, including the standing tickets); and it is already the Washington Ballet’s most successful production to-date (not counting The Nutcracker). The Cincinnati Ballet and Ballet Hawaii have already licensed the production for their 2012/13 season.